Help us reach 100,000 signatures by Dec 2, 2014! 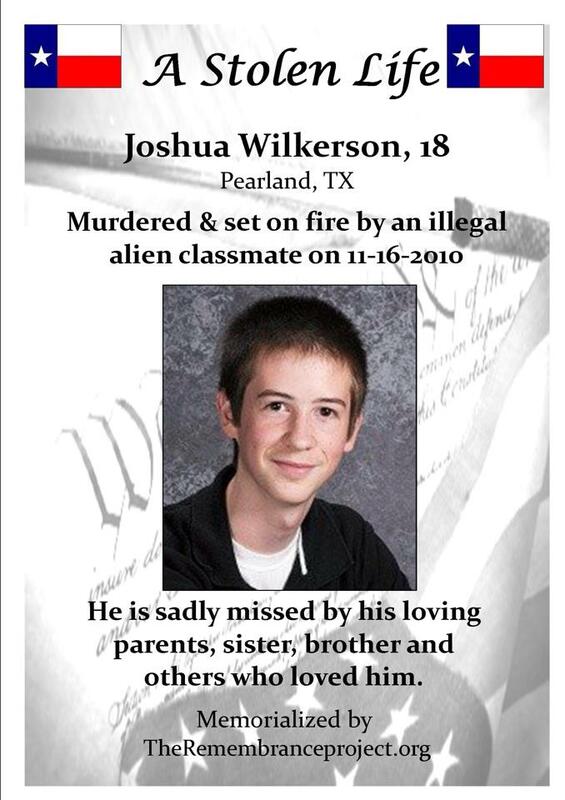 Friends and family members of murdered teen, Joshua Wilkerson, and a small group of supporters gathered near the site of his 2010 murder to mark the Fourth Annual National Remembrance Day for Victims Killed by Illegal Immigrants Sunday (Nov. 10). The vigil was organized by the Remembrance Project, a non-profit that aims to raise awareness of the issue, as part of a national movement to remember people killed by undocumented immigrants. Activist Maria Espinoza, Co-Founder and National Director for the Remembrance Project, also spoke at the vigil. “Today in cities and towns all across America, family members, friends and compassionate citizens are gathering to remember those stolen lives, our friends, our loved ones, whose lives were stolen by the illegal acts of illegal aliens,” Espinoza said. She later read a letter asking President Barack Obamav to draw on federal money to cover burial costs and counseling among other things to families members of victims. 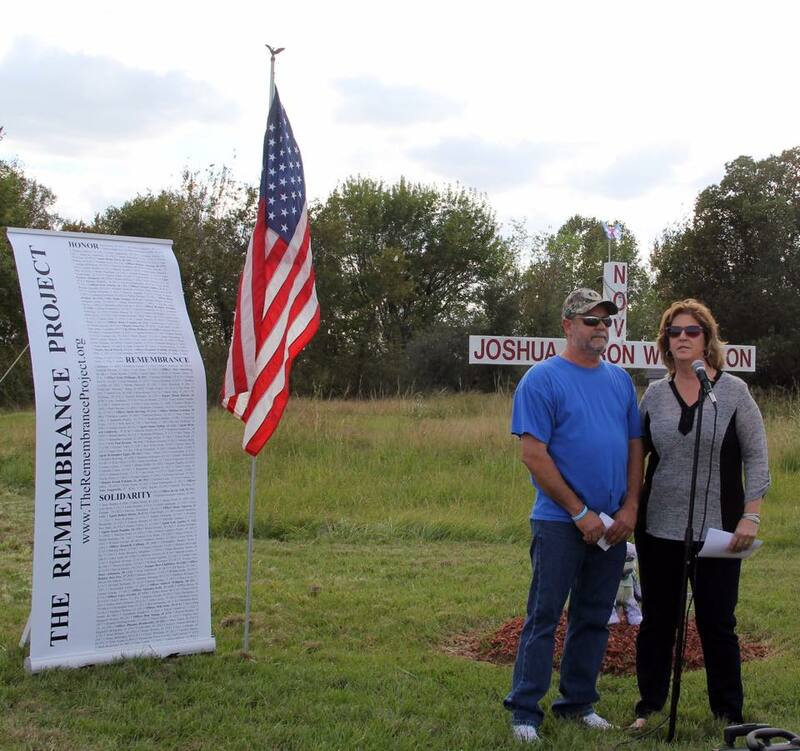 Project displays a 15 foot-long containing the names of murder victims killed by illegal immigrants. Behind her supporters hold quilts created to honor victims at a gathering held to mark the Fourth Annual National Day of Remembrance Sunday (Nov. 2). “These killings must stop. The U.S. border must be protected. There must not be one more American life sacrificed,” Espinoza told the crowd. 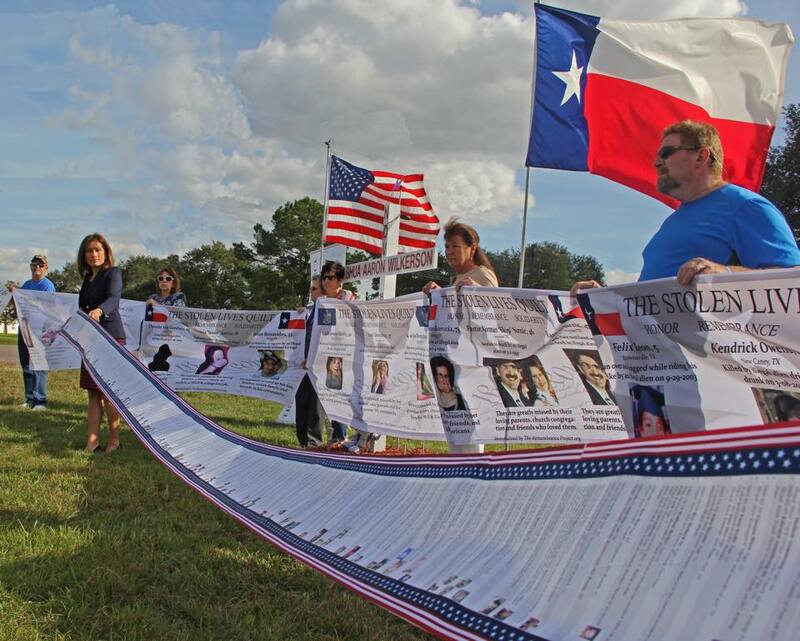 At the close of the vigil, Espinoza and other supporters displayed a 15 foot-long list containing names of victims and quilts showing victims’ faces and information. America is inherently multilingual, but for the sake of unity and equal protection of the laws, we must make English the official language for all U.S. Government business. If New York’s Times Square is The Crossroads of the World, then America is the Spaghetti Junction of the world’s languages. A rich labyrinth of dialects and idioms spoken in the home, classroom, television, emblazoning emblems and motoes. English is at the confluence, but multilingual maps lead travelers through crumbling onramps into mammoth bottlenecks and direct traffic over bridges to nowhere. America is becoming officially multilingual, funneling immigrants down the slow lane into squalid tunnels of dependency with no light at the end. More than ever, we need federal legislation making English our official language so that all citizens and legal immigrants can access the speedy thoroughfare toward the broad, sunlit uplands of equal opportunity. Consider that Executive Order 13166, signed by Clinton in 2000, requires any entity that receives federal money to provide services in any language. Fourteen years later, overzealous attorneys awash in racial hubris in the DOJ’s Civil Rights division are persecuting entities that receive government money but haven’t implemented vigorous language services. Apparently it’s a violation of Title VI of the Civil Rights Act which prohibits discrimination based on national origin, among other things. Furthermore, government policies that have an adverse impact on limited English Proficient (LEP) individuals constitutes a violation. Just last month the DOJ and DOL released their joint investigation into Washington State’s Department of Labor & Industries’ policies, practices, and procedures regarding services provided to LEP individuals. Their report highlighted deficiencies in the agency’s language assistance programs; among other things, they’re supposed to translate vital documents not only into Spanish, but also Russian, Korean, Chinese, Vietnamese, Laotian, and Cambodian. Disparate impact is controversial in part because it intentionally discriminates against the majority to avoid unintentional discrimination against the minority. The doctrine is particularly onerous in housing and employment cases where it essentially justifies intentional discrimination to remove perceived and unintentional disparate impact on the few. Indeed, adherents of this controversial doctrine recently scrambled to withdraw disparate impact cases from SCOTUS’ docket in fears the high court will disassemble it. With English officially established at the federal level, DOJ attorneys who link language barriers to national origin discrimination through the application of disparate impact will be compelled to restrain their mission to overcompensate for all their perceived wrongs. Then we can truly help LEP individuals en masse, rather than cherry pick court cases. And the DOJ can then divert more resources to investigating radical Muslims in Minnesota who go fight for ISIS. They may be well intentioned in their complaints of unintentional discrimination, but their efforts to help English language deficient immigrants are counterproductive in the long run. Born from indoctrination in Civil Rights orthodoxy, their agenda perpetuates immigrants’ subservience to government assistance and thereby consigns them to second-class status in perpetuity. I know people from most of the countries listed above. They have reasonable IQs but are hardly brilliant; yet, at minimal cost, they managed to become English proficient and flourish. Rather than give them a fish we were kinder in the long run and taught them to fish. Rather than provide LEP individuals with translators, we should teach them to translate. 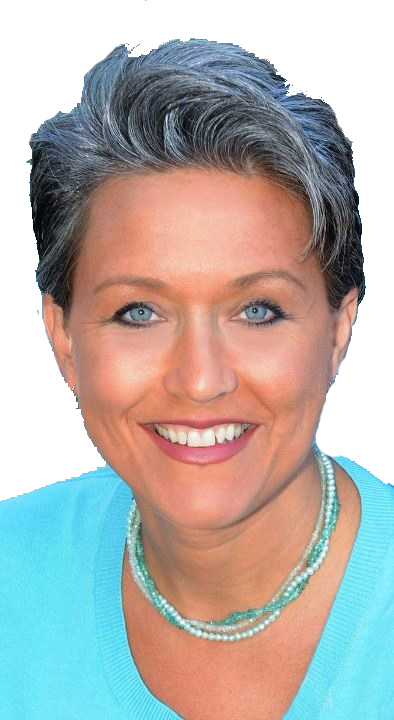 Establishing English as our official language will truly help legal immigrants read the right road map, enabling them to navigate in the fast lane around, through and over Spaghetti Junction. Indeed many immigrants testify that the rewards of learning English far outweigh the effort. None other than Senator S.I. Hayakawa, who introduced official English legislation to Congress in 1982, perceptively stated “Bilingualism for the individual is fine, but nor for a country.” He would know, the son of Japanese immigrants became a luminary in semantics and language patterns. America is a generous and caring nation. We go out of our way to provide accessibility to government services, particularly for those with disabilities; for example, making online content and PDF documents readable by speech recognition and software that aids the blind. It seems demeaning to pigeonhole LEP individuals as having accessibility issues simply because they haven’t learned English properly. Let’s give them a helping hand to learn our robust language, while applying some motivation that their assistance and services are only provided in Official English. Our fractured political entities are often dysfunctional, but they should be able to coalesce around making English our official language since polls consistently show that a large majority of Americans favor it. Official English is not “English Only.” Americans honor our nation’s rich heritages, and the rights of households and private entities to speak their native tongues. Official English weaves together our rich tapestry of cultures, ensuring that LEP immigrants become more assimilated into the country of their choice, not birth. Eventually they will acquire the skills to become less dependent; they will learn to fish. They will feel fully American. That’s a win-win-win in any language. 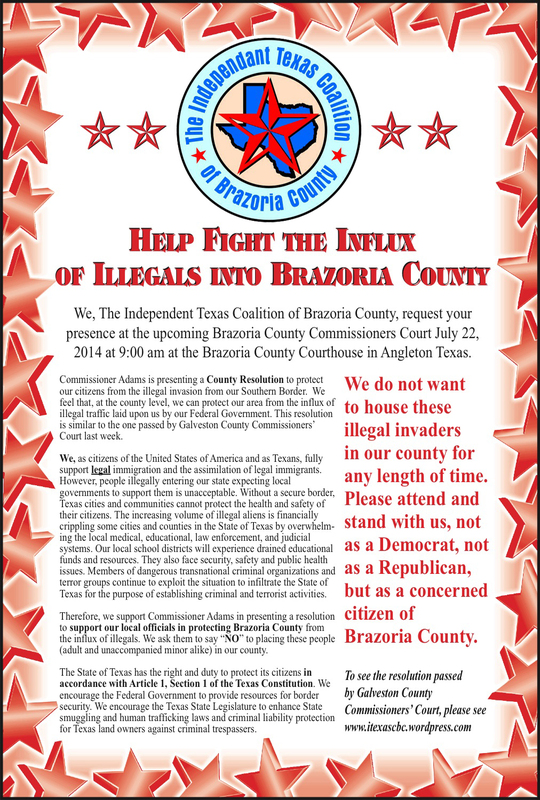 Help Fight the Influx of Illegals into Brazoria County, Texas! 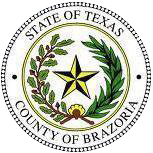 Note: Galveston County Texas also adopted the same resolution on the same day! 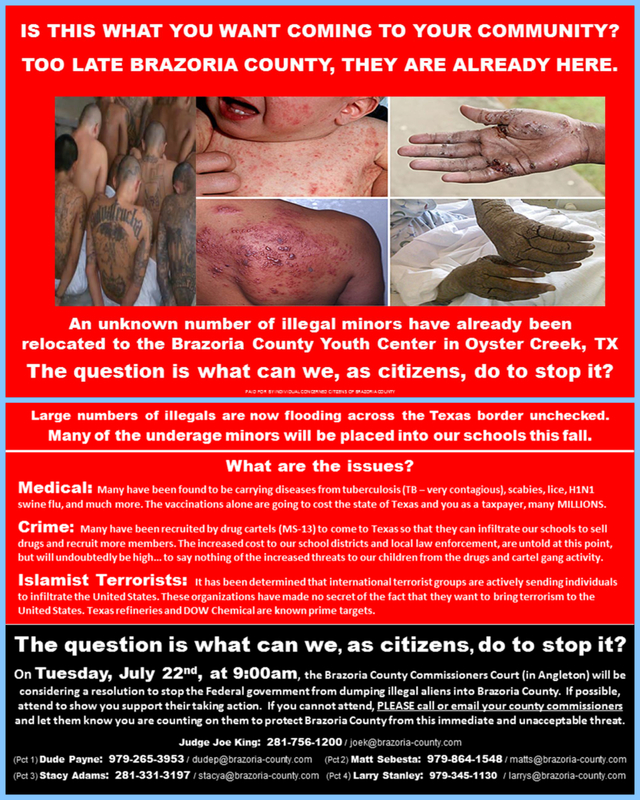 Latinos Warn Against the Texas Solution! Strike the “Texas Solution” from the platform! 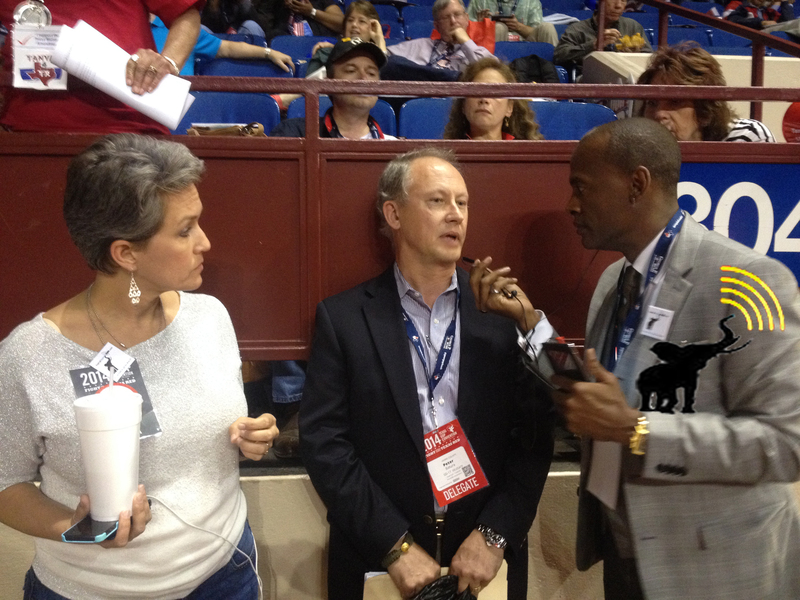 We will NOT sell-out Texans!